Find the winner in our fiendish new market, all explained here! This is a fun betting market for all election obsessives out there. Check out our Labour Landmine list – the idea is to see how far down the list you’ll have to go before finding a constituency that will be won by Labour. If you think Labour will do better in Scotland than the polls suggest, Glasgow Central might be the bet. On the other hand, if you are expecting a poor night for Ed Miliband, perhaps you’ll be looking at one of the options at the bottom of the market. I think we can be fairly sure they’ll win Bootle, but could they really lose all the others above it? So, if Labour fail to win Kettering and Reading East but succeed in Enfield Southgate, that’s the winning selection,and everthing else counts as a loser. Just to make it tricky, we’ve included all sorts of different types of seat in there. 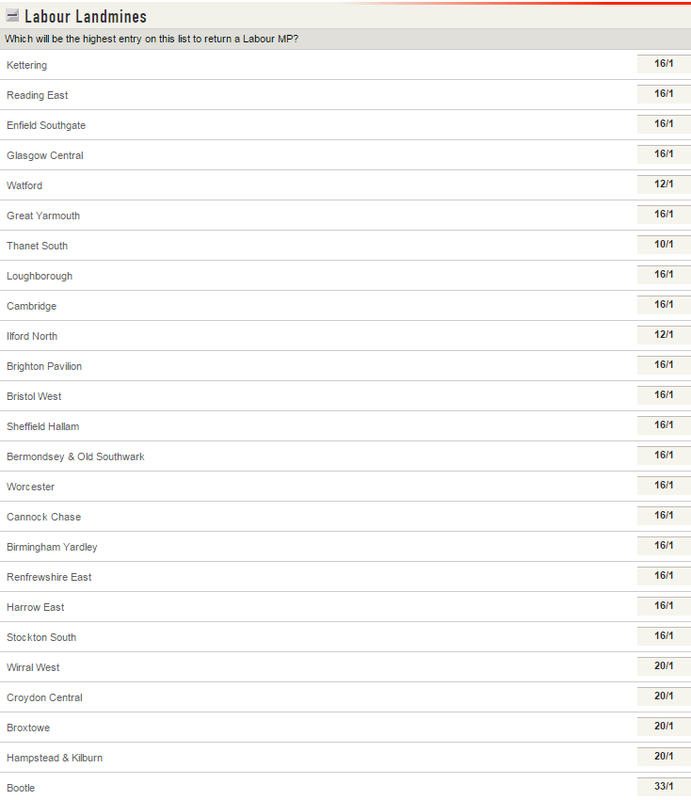 According to the individual seat odds, the first one on the list that Labour have over a 50% chance of winning is Harrow East. But for that to win, Labour will also have to fail in the 18 seats above it in the Landmine list.